Aside from falling off the pier my trip to Brighton for their science festival last weekend was a resounding success. Whilst chatting to some students at the end I was asked an interesting question, could people be carriers of Zombieism but not show symptoms. The term for someone who carries an infectious disease but displays none of the symptoms is an asymptomatic carrier. 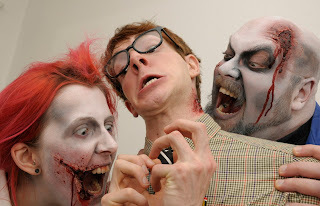 Here at the Institute we believe that zombies are most likely going to come about as the result of a prion disease similar to mad cow disease (vCJD). So it makes sense to use vCJD here as a comparison. It is assumed that any population exposed to mad cow tainted meat will have a collection of asymptomatic carriers. This is because prion diseases have a long incubation period (usually many years) thus anyone infected but not developing clinical signs could be a ‘permanent asymptomatic carrier’. Can these human carriers then go on to infect others unknowingly? Not unless we’re eating their brains. Prion disease is presently not spread through the air or fluid contact. To catch Prion Zombieism we must either: eat an infected meat product, touch infected organs (mainly brain) then an open wound/sore or receive a blood transfusion from a prion zombie. If you’re not a cannibal it’s probably only the blood transfusions you need to look out for. Thankfully there may be a new development that will help us out with that. Prof John Collinge, with the support of the National Prion Clinic has developed an almost 100% accurate blood test for vCJD. It still requires refinement but it estimates perhaps 1 in 4000 will test positive. The next question will be how many will go on to develop the disease. From a Zombieism perspective this test should be adaptable for our uses and might allow us to identify carriers from the outset. However we believe the initial source will be animal that will then be eaten by a human. This test might be a new tool for the Noah Project that is currently working to find possible zombie animals. So the answer to today’s question, ‘can people be carriers of prion Zombieism without realising it’ is a firm yes. But, these people are highly unlikely to infect others. Stay vigilant Zombiology Students and if you’re in the Newcastle area pop down tomorrow evening to my lecture on the Tyneside Cinema, 8pm. If you’re not in Newcastle other lecture dates are below. This is an all day event with Doctor Austin on hand to sign books, answer questions and teach Zombie Combat skills. It will be topped off with a 60 minute early evening lecture.